Hatters striker Paul Benson would relish the chance of playing against Town’s fiercest rivals Watford in the second round of the Capital One Cup. The pair haven’t faced each other since April 2006 in the Championship, when Luton earned a 1-1 draw at Vicarage Road, but they could meet as the Hornets enter the draw on Thursday evening. 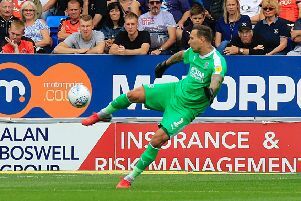 Benson, who scored Town’s second during the 3-1 victory over Bristol City 3-1 last night, also picked out Premier League opposition too when asked who he would like, saying: “It’s tempting fate to say Watford at home, the police wouldn’t like that one too much, but that would be good. Striker partner Jack Marriott was on target twice too as Hatters reached the second round of the competition they won in 1988, for the first time since 2007. Then they made it as far as the fourth round, losing at home to Everton after extra-time and Benson would love to repeat that progress this term. He continued: “Hopefully we can go on a bit of run in this cup, as it’s one thing we haven’t really done since I’ve been here is have a successful cup run. The forward didn’t believe that extra games to Town’s league campaign would be a problem either, particularly with the quality of player that boss John Still has added to the squad this season. He said: “A lot of people say they don’t like too many games coming, but you’ve seen with the size of the squad, we’ve changed eight players and we still won 3-1. >>Luton will find out their second round opponents live on Sky Sports 5 and Sky Sports News on Thursday evening after the televised fixture between Doncaster and Leeds. The draw will be seeded with the 12 Premier League clubs not involved in UEFA competitions automatically seeded along with the top 12 winners from round one based on last season’s final league tables. The eight Premier League Clubs involved in UEFA competitions will enter the competition at round three stage as per previous seasons. The tie will take place in the week commencing August 24.